Now on view in Arizona Biennial 2015: Confluent, The Lake a Lilac Cube, and A New Way of Thinking About Everything by Grant Wiggins. Arizona Biennial 2015 was unveiled at Tucson Museum of Art on Friday night, and I was absolutely delighted to experience the show in person at the opening night celebration. You’ll be able to find the three paintings I’m showing at the very end of the exhibition — where the abstract works are located — on what I believe is the museum’s tallest wall. I fondly call this the “Great Wall.” It has an epic, almost monolithic quality, and for me holds a special meaning. In 2007, I showed my painting ff0000turo in this exact same location. Having the opportunity to exhibit here eight years later, on the full breadth of the wall, I could not ask for more. I feel both a circularity and a sense of advancement — an awareness of how much my work, my thinking, and my life has changed. 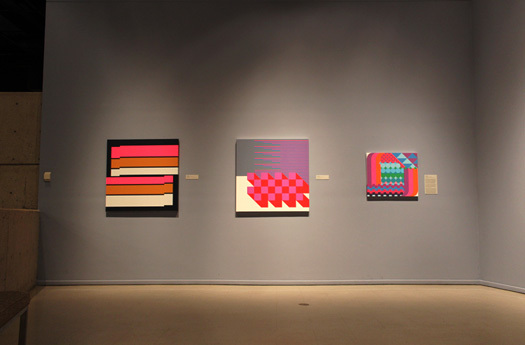 A return to Tucson Museum of Art’s “Great Wall”: From left, ff0000uturo in Arizona Biennial 2007 and the same wall today. The curator of Arizona Biennial 2015 is Irene Hofmann, Phillips Director and Chief Curator of SITE Santa Fe. For this exhibition, 530 Arizona artists submitted nearly 1,500 works. Ms. Hofmann selected 50 works by 33 artists. In her statement discussing her curation of the exhibition, Ms. Hofmann observes that while she “didn’t initially set out to develop a thematically structured show,” several “strains of exploration” emerged in her review of works submitted. The show is arranged according to those themes. Works that reflect upon nature, and humankind’s impact upon it, open Arizona Biennial 2015. The theme of reclamation is later explored by works that give new life to discarded materials, as well as overlooked, everyday objects. Violence and control are then addressed in a variety of media. 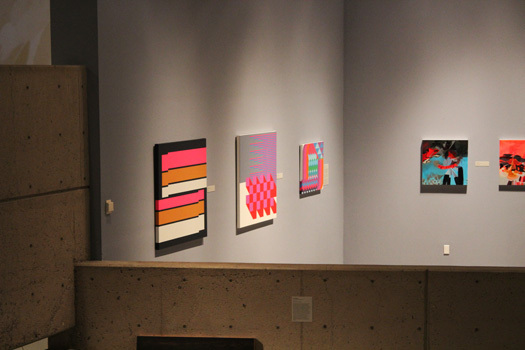 The sedution of painting: Abstract works by Grant Wiggins, Angie Zielinski (right), and Mike Stack conclude the show. I am deeply honored to be showing in Arizona Biennial 2015. It is energizing and inspiring to be exhibiting among so many gifted, accomplished artists, who were united by masterful curatorial judgment. I offer my gratitude to Ms. Hofmann and the entirety of the Tucson Museum of Art’s staff, who have staged an exhibition that proudly represents the artistic currents flowing through our state. I am absolutely thrilled and honored to announce that three of my paintings have been selected to exhibit in Arizona Biennial 2015, to be held at the Tucson Museum of Art from July 25 through October 11. This will be my fifth time showing in an Arizona Biennial — and my seventh show overall at the Tucson Museum of Art — since 2003. I exhibited consecutively in the 2003, 2005, 2007, and 2009 biennials. After six years away, my upcoming return to Tucson is especially meaningful. Nearly 1,500 works were submitted to Arizona Biennial 2015. Juror Irene Hofmann, director and chief curator of SITE Santa Fe, selected 50 works by 33 artists. A range of mediums will be represented, including painting, sculpture, works on paper, photography, video, and installation art. The three pieces selected for this summer’s biennial, shown below, reflect my maximalist and minimalist approaches to painting. A New Way of Thinking About Everything. 2014. Acrylic on canvas. 24 x 28 inches (61 x 71 cm). The Lake a Lilac Cube. 2014. Acrylic on canvas. 40 inches square (102 x 102 cm). Confluent. 2015. Acrylic on canvas. 40 inches square (102 x 102 cm). First organized in 1948, the Arizona Biennial is a juried exhibition that provides an opportunity to see some of the most interesting new work being created in Arizona. It is the oldest running juried exhibition featuring exclusively Arizona artists. The Arizona Biennial is open to artists age 18 and older who currently reside in Arizona. In closing, I offer my most sincere congratulations to my fellow Arizona Biennial 2015 artists: David Emitt Adams, Elizabeth Burden, Carlton Bradford, Curt Brill, John H. Clarke, Jeffrey J. DaCosta, Jeff Dodson, Abigail Felber, Denis Gillingwater, Jennifer Holt, Alan Bur Johnson, Daniel Johnson, Carolina Maki Kitagawa, Carolyn Lavender, Ellen McMahon and Beth Weinstein, Brooke Molla, Katherine Monaghan, Anthony Pessler, Emmett Potter, Rembrandt Quiballo, Robert Renfrow, Prima Sakuntabhai, Patricia Sannit, Steven R. Schaeffer, Mike Stack, Lauren Strohacker and Kendra Sollars, Novie Trump, Zachary Valent, Kathleen Velo, and Angie Zielinski.